Don’t use broad-spectrum pesticides in your yard: Many common yard and garden pests, including aphids, whiteflies, and various annoying gnats and midges, are just the right size for hummingbirds to eat. Even if the birds don’t sicken and die from eating poisoned prey, spraying pesticides destroys an essential source of natural nutrition and makes your yard less attractive to them. Switch to targeted, low-risk remedies for specific pests, such as a hard spray of water under leaves for aphids and various forms of the natural pest pathogen “Bt” (Bacillus thuringiensis) for caterpillars and mosquitoes. Also, beware of purchasing hummingbird flowers from mainstream garden centers. Many of these plants have been unnecessarily treated with the same neonicotinoid pesticides that have been implicated in the terrifying declines of honeybees, native pollinators, and native insect-eating birds. Cultivate a compost pile: Fruit flies are attracted to decaying vegetable matter, including fruit rinds and scraps. Garden experts often advise against adding fruit to compost piles/bins in part to discourage fruit flies, but these tiny insects provide excellent hummingbird food while aiding the composting process. Grow your own fruit flies: There are lots of recipes on the Web. When a culture matures, just set the container in your garden and open it so the flies can escape. Beet juice in hummingbird feeders: NO! From the spectacular Green River Formation of Wyoming comes a tiny fossil that researchers have identified as a possible relative of both hummingbirds and swifts. When Eocypselus rowei, whose genus name is Greek for “dawn swift,” died approximately 50 million years ago, it fell into shallow, oxygen-poor water and was covered with fine layers of mud that preserved minute details of its body and plumage. Except for its long wings, the fossil shows few hummingbird-like characteristics. Its stubby bill is more like those of swifts and suggests that, like them, it fed on flying insects. Though about the length of a Magnificent Hummingbird (12 cm, 4 3/4″), its short bill, proportionally larger skull, and longer wing and leg bones would have made it heavier. “Shadows” in the stone surrounding its bones are fossilized pigment structures that would likely have given it a glossy, possibly iridescent black color like many modern swifts. Though hummingbird fossils have been found so far only in Europe, Eocypselus shows that possible distant hummingbird ancestors did occur in the Americas. After posting a bunch of second-hand/theoretical advice for keeping hummingbird feeders from freezing, I found myself and my clientele (several Anna’s and a Violet-crowned or two) facing a forecast low of 13º F. (-10º C.). My northern friends will smirk (and rightly so), but this is southern Arizona for peeps‘ sake. Since temperatures this low are such a rare event here, insulating the feeder seemed like the most sensible (and cheapest) approach. Besides, my crochet hooks had been collecting dust since last fall, and this was a good excuse to get back to hooking. So to speak. After a quick stop to shop for appropriately colored yarn and about two hours of hooking, unraveling, and rehooking, I had a crocheted feeder cozy for an 8-oz. Nature’s Best (my all-time favorite bottle feeder that’s no longer available, sadly). Before calling it a night, I filled a clean feeder with hot 3:1 solution, slipped on the cozy, and stumbled across the starlit yard to hang it in one of the more popular spots. Another Nature’s Best that had been out all day had frozen beyond the Squishee stage already, with a band of syrup trapped between solid layers of ice. When I finally got around to checking the feeder this morning (about an hour and a half after sunrise), there was no ice in the bottle at all, but swirls of denser syrup indicated that at least some of the solution had frozen. Interestingly, the HummZinger Mini hanging in front of the poorly insulated living room window showed no signs of having frozen, despite containing a smaller volume of solution with larger surface area and getting very little morning sun to warm it up (it’s on the north side of the house). I was a little worried about how the hummingbirds would respond to the weird appearance of their feeder. The female Violet-crowned Hummingbird didn’t seem the least bit put off by the bright red “sweater,” but then she didn’t have to wear it. Wrap your feeder in outdoor-rated incandescent Christmas lights (the old style, not energy-efficient LEDs). The bulbs should produce enough heat to keep the sugar water slightly above air temperature, especially if you add an outer layer of aluminum foil to reflect heat and block wind. Wrap your feeder in pipe heating tape under a layer of insulation. Thermostatically controlled models will save energy by turning on as necessary to keep the solution just above freezing. Invert your sugars. The freezing point of a solution depends on the number of molecules present. More solute (sugar) molecules make it harder for the solvent (water) molecules to link up. Inverting your sugar, which breaks each sucrose molecule into one of fructose and one of glucose, doubles the number of molecules and depresses the freezing point by a few additional degrees without adding additional sugar. To invert ordinary table sugar, combine 2 cups sugar with 1 cup water, adding 1/2 teaspoon lemon juice or 1/4 teaspoon cream of tartar to speed up the reaction. Heat the solution to a low boil on the stovetop in a heavy saucepan, washing down the sides of the pan with a little additional water to dissolve any stray sugar crystals. Use a candy thermometer to monitor the temperature, which will rise above the boiling point of water as the water in it boils away. Once it reaches 230° F., remove the pan from the heat and allow the syrup to cool, then pour it into a clean jar, pop on the lid, and store in the refrigerator. Substitute invert syrup for no more than half of the sugar in your feeder solution and reduce the water slightly (by about 2 tablespoons per cup) to compensate for the water in the syrup. Safety first! Lights and heating tape present fire and electrocution hazards. Use only products that are rated for outdoor use, including extension cords. Do not use electric heating pads outdoors! Don’t enclose Christmas lights inside a cozy or place a cozy-covered feeder too close to a heat lamp—it could start a fire. Heat lamps or Christmas lights may melt the flimsy plastic of discount-store feeders. On 5 October, 2010, at the hummingbird feeding station at Cabañas San Isidro east of Quito, Ecuador, two male Fawn-breasted Brilliants fell to the ground together. They appeared to have their feet intertwined and their bills were jabbing each other. It was 15:31 and a light rain had begun. They stayed quiet in the wet grass with one bird on top of the other. Both birds had their wings extended fully. The bird on top had its long bill stuck into the neck feathers of the bird underneath. The bird dominating the other would move its bill from the neck to the wing, probing and sometimes grabbing feathers. After about ten minutes, the bird underneath would fight to release himself from the bird above. They flopped sideways and moved a few centimeters, but the dominating bird stayed on top. They would stay quietly in the grass for several minutes, then the struggle would be repeated with the same results. The rain grew heavy and this struggle continued for one hour and forty minutes. At 17:11 the dominating bird flew up to a sugar water feeder and sat on top, not on the perch, and drank for half a minute. Then it flew away. The other hummingbird was picked up from the wet grass. It was thoroughly wet, but alive, and showed no indications that its flesh had been pierced by the other bird’s bill. The defeated bird would surely have died without help. It was taken back to the kitchen at Cabañas San Isidro where it was warmed and fed sugar water. It too flew off after about fifteen minutes. Emphasis added to highlight additional evidence of the inadequacy of a hummingbird’s bill as a weapon. Poking? Yes. Grabbing? That too. Piercing? Not so much. Just a quick response to whoever is searching for information on whether the sugar water in feeders causes diabetes in hummingbirds. Sugar doesn’t cause diabetes in people, either, but most of us eat way more of it than big sluggish mammals should. This contributes to obesity, which is a significant risk factor for developing type 2 diabetes. Search of the Week: Why don’t hummingbirds get diabetes? Contact a wildlife rescue organization IMMEDIATELY. To find one, use the links at the end of this post or a Web search, or call your state wildlife agency for a referral. DO NOT contact me about it—I can’t help you, and the bird may die while you’re waiting for me to respond. It’s wildlife baby season over much of North America, a time when people with big hearts and inadequate information sentence untold thousands of young wild birds and mammals to needless suffering and death. Inappropriate diet is a major killer, resulting in stunted growth, rubbery bones, and feathers that break as they mature (if they mature at all). The greatest tragedy is that many of these “orphans” never needed intervention in the first place. Hummingbirds are frequent victims of misplaced concern. Female hummingbirds spend large amounts of time sitting on their nests during the first three to four weeks of the nesting cycle, incubating the eggs and brooding the tiny, featherless chicks. The nestlings need this near-constant attention at first because they are “cold-blooded” (poikilothermic) at hatching and require their mother’s body heat to live and grow. Once the nestlings’ pinfeathers break open and expand into an insulating coat of true feathers, their metabolism is ready to switch to “warm-blooded” (homeothermic) mode. At this point, 10 to 12 days after hatching, the mother no longer needs to brood them to keep them warm, even at night. To avoid attracting the attention of predators, she stays away from the nest entirely except for the few seconds it takes to feed them. These visits occur at intervals ranging from less than ten minutes to more than an hour and a half. IF YOU FIND A HATCHLING HUMMINGBIRD [gray/black, skin naked or covered in quill-like pinfeathers], DO NOT ATTEMPT TO FEED IT! GET HELP IMMEDIATELY. ♦ Try to keep the baby in the nest if possible. ♦ If not, line a plastic margarine cup with tissue and keep the baby warm (this is essential) by placing it under a gooseneck lamp about 5 inches away from the bulb. ♦ Do not overheat the bird. If it starts open-mouth breathing or its neck is outstretched, it is too hot. Overheating can kill the bird. ♦ Keep the baby warmed to an outside temperature—between 85—90 degrees. PLEASE WATCH THE NEST CONTINUOUSLY FOR ONE HOUR FOR THE RETURN OF THE MOTHER. [I’d recommend lengthening this to two hours.] She will fly in to feed them, which takes only 3-5 seconds, 4-6 times an hour. 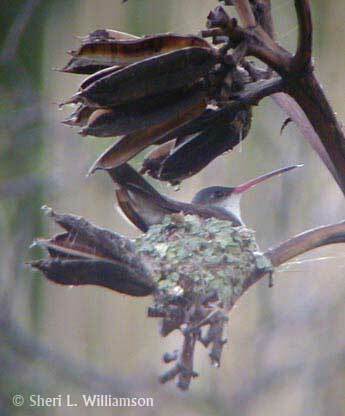 In our experience, mother hummingbirds normally do not abandon their young unless something has happened to the female. 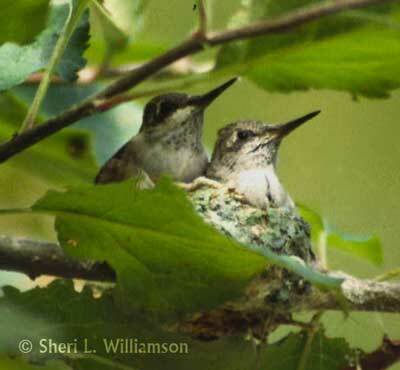 Baby hummingbirds use silence in the nest as a defense against predators. If the babies are vocalizing by constantly “peeping” for more than 10 -15 minutes they are in trouble (starving) and need help immediately. Silent babies are usually healthy babies! ♦ If they have fallen out of the nest, gently pick them up, check to be sure there are no injuries and carefully place them back in the nest. Once again watch for mom’s return. 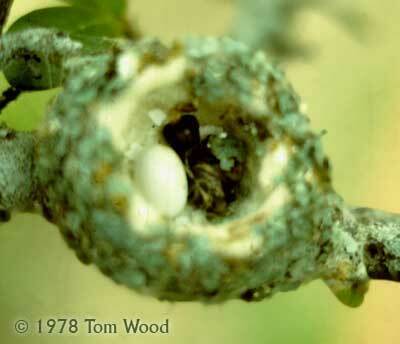 (Always check the nest first for ants or other insects that may be attacking the babies). If there is a problem with insects, an artificial nest can be constructed. ♦ After placing them back in the nest, it’s important to watch and see that the female continues to feed her young . ♦ If, after monitoring the nest site, it has been determined that the babies are actually abandoned and have to be rescued and readily open their mouth, CAREFULLY drop three drops of sugar water (see adult recipe) into their mouth. Sugar water accidentally dripped onto feathers must be completely wiped off immediately. ♦ If the babies do not open their mouths, gently guide the birds’ beak into the tip of an eyedropper or syringe full of sugar water for feeding. ♦ Offer sugar water every 30 minutes until help can be obtained. ♦ Do not feed sugar water or “nectar” longer than 72 hours. 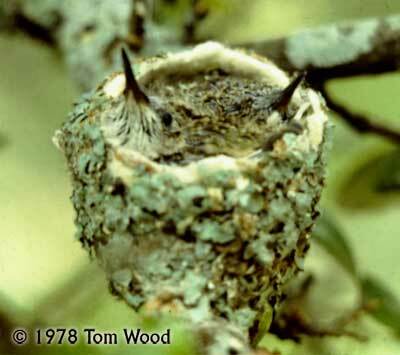 Pre–fledgling hummingbirds are fully feathered, have very short, stubby tail feathers and a bill less than 1/2 inch long. They are most often found on the ground. Once again, if you know where the nest is, please put them back and watch for mom’s return. ♦ After placing them back in the nest, it’s important to watch and see that the female continues to feed her young. ♦ If they need to be rescued and open their mouth readily, CAREFULLY drop 5 drops of sugar water into their mouth. Sugar water accidentally dripped onto feathers must be completely wiped off immediately. ♦ If the babies do not open their mouths, gently guide the birds beak into the tip of an eyedropper or syringe full of sugar water for feeding. ♦ Feed every 30 minutes until help can be obtained. You can read the entire Hummer Hints handout (PDF) at the Project Wildlife Web site. A few minutes may mean the difference between life and death for a wild creature in trouble, so right now—before you have a wildlife emergency—contact your state wildlife/natural resources agency, local animal control agency or nature center*, or the National Wildlife Rehabilitators Association for the name and phone number of a wildlife rescue organization or independent wildlife rehabilitator in your area, or use this state-by-state directory (which may not be entirely up-to-date—try contacting the person or organization to make sure the listing is accurate). Keep the name and number by the phone so that you can get help as quickly as possible should the need arise. * Normally I would recommend humane societies and zoos as resources, but not after what happened to the Wisconsin Mango. Do we see what bees see? If you’re a hummingbird gardener, you’ve probably developed a search image that helps you select flowers most likely to please your discriminating clientele. Essentially, you’re thinking like a hummingbird, associating trumpet-shaped blossoms in “hot” colors with the promise of a sweet reward. 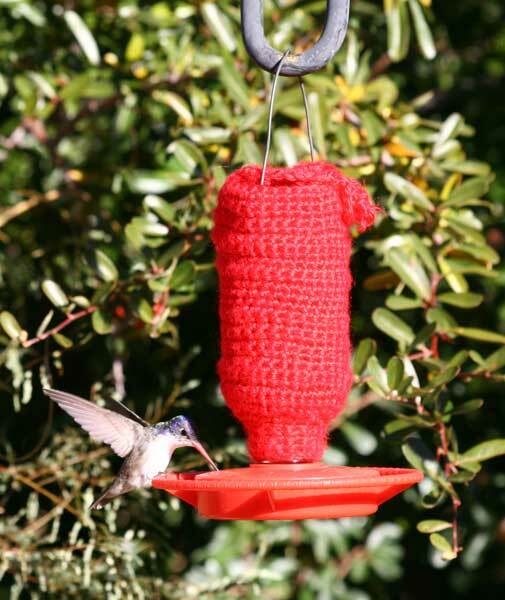 Most hummingbird feeders are based on similar visual cues, but what if your feeder sent mixed signals that unintentionally lured less welcome critters as well as hummingbirds? I first began to ponder this issue twenty years ago, when I was co-manager of The Nature Conservancy’s Ramsey Canyon Preserve. The preserve was having a lot of trouble with bees, mostly long-tongued bumblebees and carpenter bees, on some of its twenty-odd feeders, mostly the Perky Pet 210-P and similar models with yellow plastic “flowers” around the ports. As I read everything I could find about hummingbirds, including pollination ecology, it dawned on me that very few hummingbird-pollinated flowers are yellow and very few bee-pollinated flowers are red. A little reading confirmed that yellow is a color ecologists associate with flowers that are insect pollinated (entomophilous, “insect-loving,” as opposed to ornithophilous, “bird-loving”). And there’s shape, too. Those five-petaled plastic pinwheels around the feeder ports could stand in for the flowers of any of hundreds of species in the sunflower family. And who pollinates those little yellow sunflowers? Bees and other six-leggity beasties, that’s who. Since the preserve’s bookstore sold hundreds of Perky Pet feeders every year, I called the company to ask if they could make us a few red plastic flowers using the same mold as the yellow ones. A few weeks later a box arrived containing several hundred red plastic flowers. I immediately grabbed a handful and used them to replace half the yellow flowers on a couple of the problem feeders. The results were unambiguous: The bees would fly up to the red side of the feeder, buzz around, maybe land briefly, but soon take off and fly around to the other side to join their hive-mates feeding around the yellow flowers. 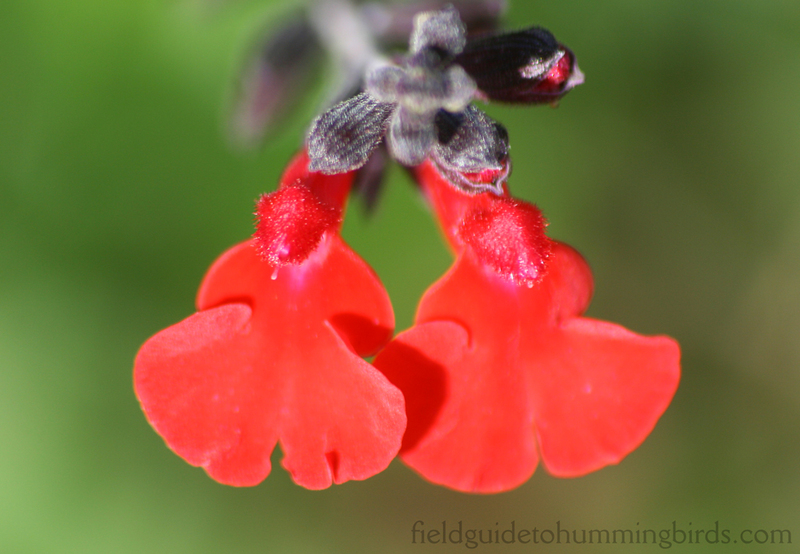 Very few remained at the red flowers long enough to discourage hummingbirds from feeding. This continued for a couple of weeks, well beyond the time it should have taken for the bees to learn to associate the red “flowers” with food. It was out with the yellow and in with the red on of all the preserve’s Perky Pet feeders. 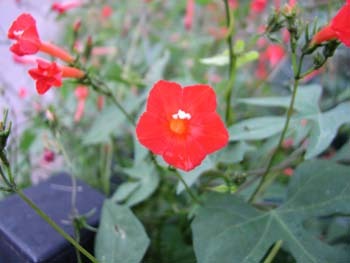 The leftover red flowers we handed out to preserve visitors having bee problems with similar feeders. Eventually we phased out Perky Pet feeders altogether (even in the bookstore), but until then this strategy helped to reduce the preserve’s bee problems. Disappointingly, when I reported these observations to Perky Pet and suggested that the company consider at least offering red replacement flowers, the representative’s only comment was, “Well, our customers like the yellow flowers.” Not their feathered customers, of course, but the ones with the cash. But some people report no problems with bees on feeders with yellow parts, and others have terrible bee problems on all-red feeders. Why are some feeders with yellow parts ignored by bees? And why do some red feeders attract bees while others don’t? Notice that none of these photoreceptors peaks in the red range (~650 nm), yet we humans (and most birds) see red reasonably well. That’s because each type of cone cell can be stimulated by wavelengths near as well as at its peak. The sensitivity declines with increasing distance from the peak wavelength, so it takes some pretty intense red light to stimulate the yellow receptors of birds and humans. So, leaving out some evolutionary bells and whistles that may enhance avian and insect color vision, bees’ eyes are substantially less sensitive toward the red end of the spectrum than our eyes or birds’ eyes. Both Rodríguez-Gironés & Santamaría and Spaethe, Tautz, and Chittka (2001) note that bumblebees presented with red flowers have a harder time locating them. Logically it should be likewise with red vs. yellow feeder parts, but it’s not quite as simple as that. Applying this conclusion to feeders, it’s clear that differences in UV reflectance between different types of plastic could make some feeders, or feeder parts, as conspicuous to bees as a neon sign in a dark alley, regardless of how they appear to human eyes. But it turns out that contrast is more important than color alone in helping bees find flowers. The compound eyes of insects are capable of very low image resolution. The view through even the best compound eye was compared by a 19th-century naturalist to “a picture about as good as if executed in rather coarse wool-work and viewed at a distance of a foot” (Land 1997). In modern terms, think about viewing a normal (low-def) TV screen or CRT computer monitor from about an inch away. Spaethe and colleagues noted that bees see color less well than contrast. The further a bee is from a flower, the larger that flower needs to be for it to be able to discriminate its color. It also takes them longer to process differences in color than differences in contrast. Naturally, the most important contrast is between flowers and the surrounding green foliage, so when searching for flowers at distances of more than a few inches, bees tend to home in on objects that stimulate their yellow-green receptors significantly more or less than the background foliage. The green receptors in bees’ eyes can be stimulated by red light of sufficient intensity, but whether they perceive the difference between a red flower and its green background depends in part on the relative intensities of light reflected from each. Color and contrast notwithstanding, a combination of opportunity and necessity may be responsible for much of the variation in bee problems at hummingbird feeders. Not only do drought, late freezes, and other factors that reduce flower availability tend to increase bee problems, but some bees may have evolved to take advantage of bird-pollinated flowers as a back-up or even primary nectar source. Raine and Chittka (2005) note that among bumblebees, the one species that showed a distinct (though secondary) preference for red is Bombus occidentalis, a species whose range in western North America is rich in hummingbird-pollinated flowers. The marauding carpenter bees (Xylocopa californica arizonensis) that rob nectar from my cultivated salvias also take advantage of the natural bounty of bright red, tubular ocotillo flowers in the late spring dry season (Scott et al. 1993). Like a naturally abundant hummingbird flower, hummingbird feeders present a rich resource for any bee capable of taking advantage of it. A poorly designed feeder is going to be more profitable for bees to exploit than a thoughtfully designed one, which is why a feeder’s vulnerability to bee problems may go beyond color. Until we know how different hummingbird feeders appear to bees and other insects, we can’t be absolutely sure how much influence color alone has on the potential to attract unwelcome feeder visitors. Nevertheless, the scientific evidence clearly indicates that it’s wise to avoid feeders with parts that reflect light in the yellow to violet “bee-friendly” portions of the visible spectrum. Goldsmith, T.H. 1980. Hummingbirds see near ultraviolet light. Science 207:786-788. Scott, P. E., S. L. Buchmann, and M. K. O’Rourke. 1993. Evidence for mutualism between a flower-piercing carpenter bee and ocotillo: use of pollen and nectar by nesting bees. Ecological Entomology 18:234-240. Hmm…that reads almost like a straightforward (if somewhat garbled) summary of hummingbird reproductive behavior, doesn’t it? Not what one would expect from the post’s racy title. Curiosity got the better of me, so I clicked the link expecting to see a bunch of Google ads wrapped around some bland hummingbird content stolen from another site. The accompanying photos are almost certainly used without permission, and the text might be as well, but it looks like it was written in some language other than English and run back and forth through Babel Fish before being pasted into the blog post. Trust me – it’s not graphic, just charmingly bizarre. The site appears legit, too, so read it now before the Councillor Watch blogmaster takes it down.